Hermit River Knives, Puukkos, Nordic designs. 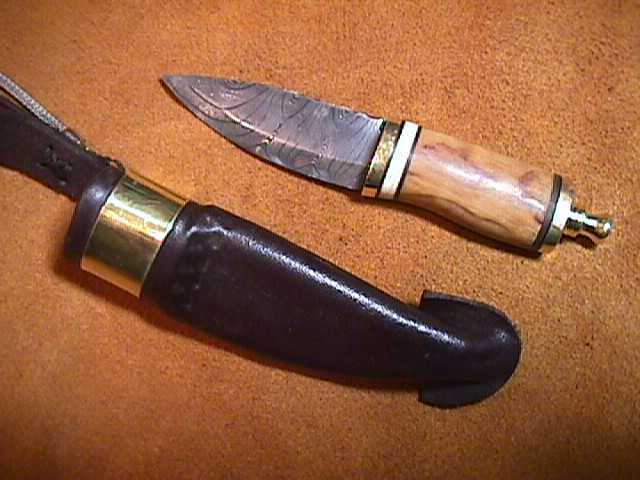 Welcome to my Nordic knife page 2. Here you will find some more of the finest handling and cutting knives. Only some of these are a tad smaller. Don't let the size throw you. 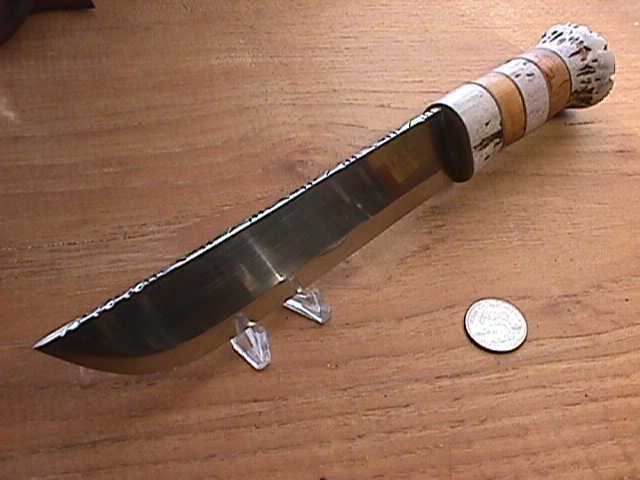 A knife with a 2 inch blade, 5/8" deep, 1/8 thick will do about 90% of the daily chores we come across. It will open an envelope with flair, opens packages with gusto, cuts tape, strings, even the end off your fine Cuban cigar. 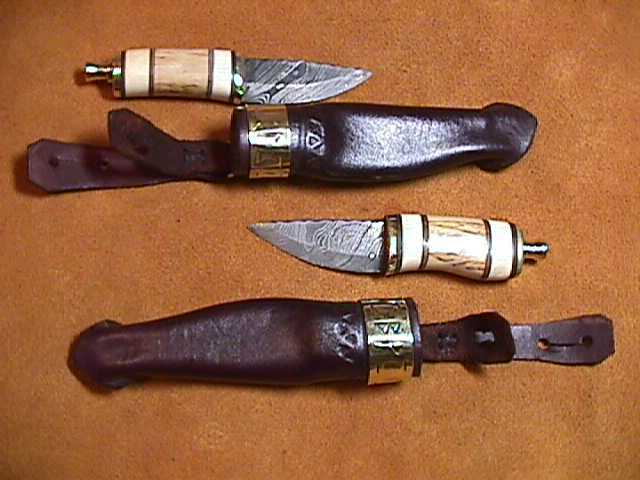 The knives are all heat treated and sharpened, sheaths are double hand sewn, internal catchers just like the big boys. 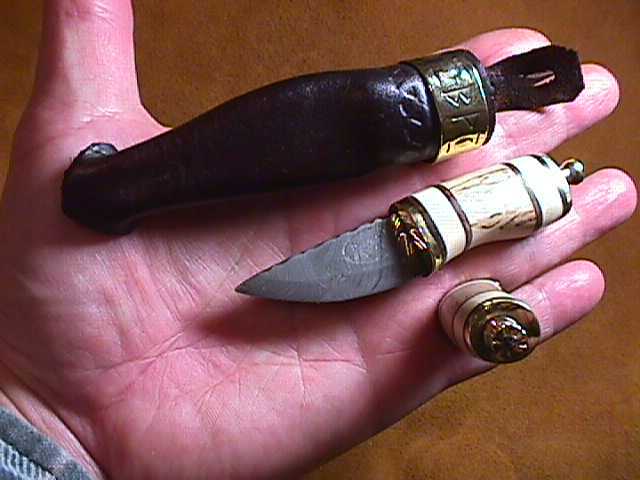 These are in every way a functional puukko and a really cool knife to wear off a button, a broach, a pin or a removable watch fob keychain can be attached like the second group of pics. Remember to check back frequently on Nordic Page 1 Please e mail me with any questions. Thank you for looking,, Hermit. I made several of these leuukos and cannot keep them in stock. Maybe I need to raise the price?? 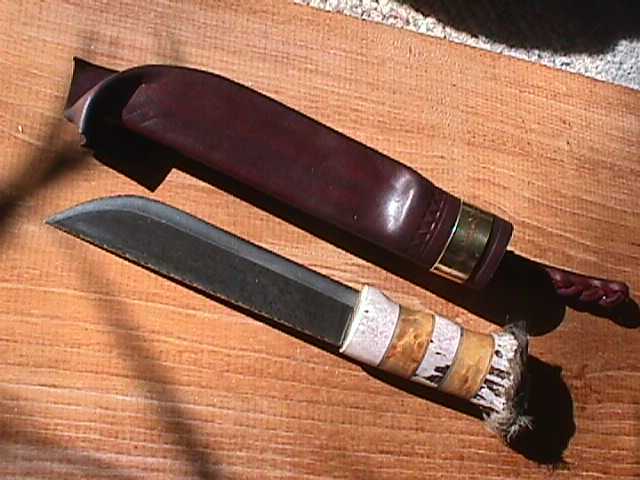 The top one still has some moose fur at the end, crown or as it is properly called, the "rosecrantz". 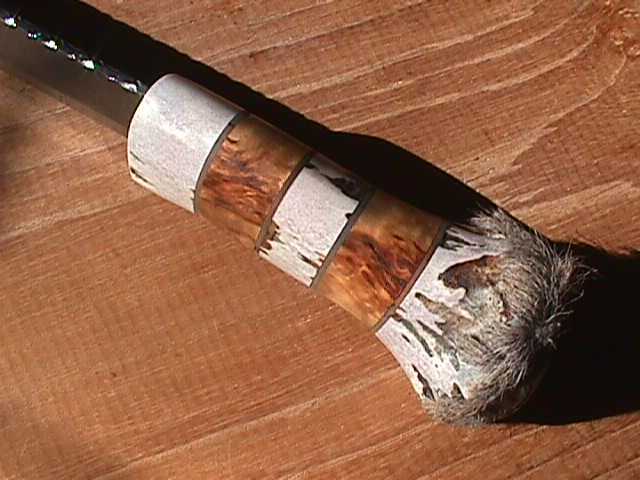 The handle is made of well weathered moose antler which was sealed, brass or nickle silver, nordic curly birch soaked in linseed. 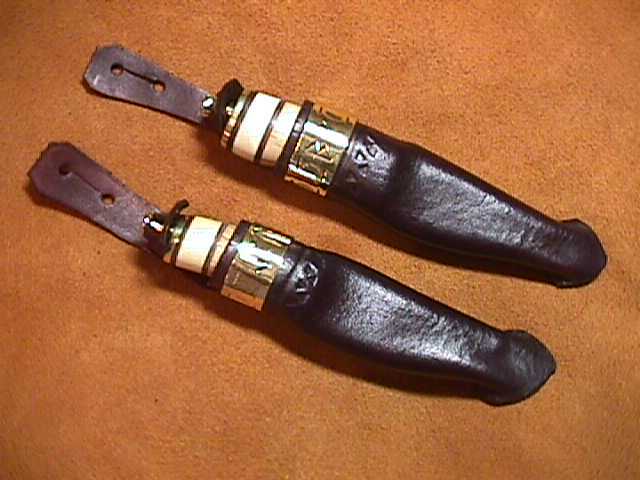 Leather spacers provide a non slip grip when the knife is wet. 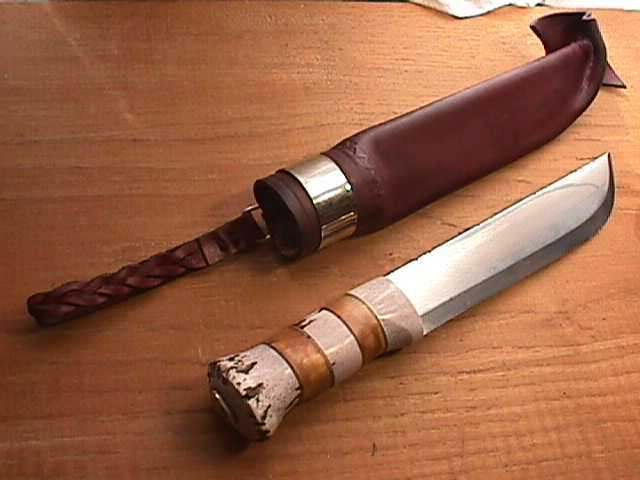 The blade is Swedish high carbon steel. 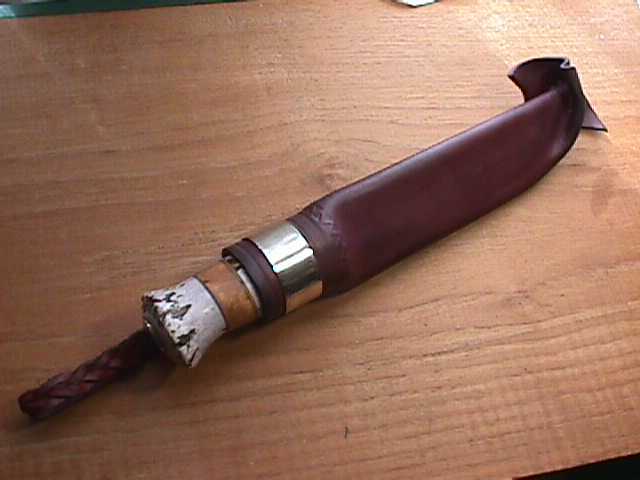 The sheath is vegetable tanned tooling leather. The brass or nickle silver chape at the top is removable for cleaning and conditioning, it also attaches the "mystery braid belt hanger. 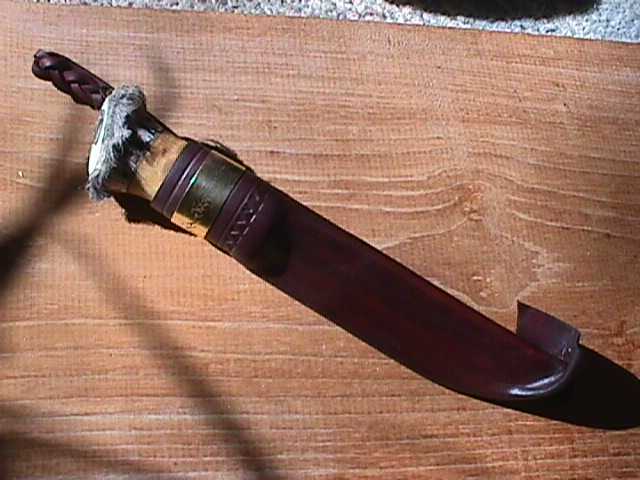 This sheath also has a bladecatcher internal to the leather. SOLD but of course I could make you one, the blades can also be had in a black nostalgic finish..